New technology that is helping researchers examine the bottom of the lakes and seas of the world is uncovering more and more ruins of great cities, stone monuments and structures that give evidence of ancient civilizations that walked this planet in an ancient past . . . before the waters exist like they do today. Among the recent discoveries is a massive carved stone monument off Yonaguni Island in Southern Japan that has been dubbed the Yonaguni Monument. Since its discovery in 1985 by Kihachiro Aratake, a local dive tour specialist, researchers have been studying the massive rock formation plus ten other nearby structures that imply an ancient city stood there an estimated 10,000 years in the past. 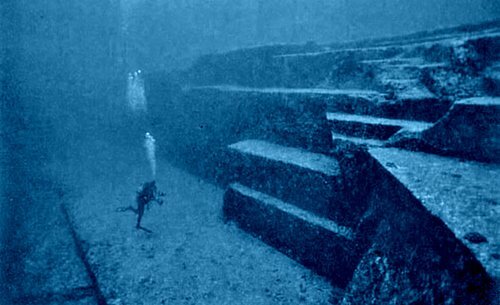 The Yonaguni Monument itself appears to have been carefully carved by human hands from a solid piece of sandstone. While it resembles a “type” of ziggurat, the structure is instead a 490 by 130-foot rectangle that rises 90 feet from the sea floor. The top of the monument is only about 16 feet under the sea but divers must drop to the bottom to view all of the ruins. The structure has various squared levels, plus stair steps carefully cut in the stone. At the top is a carved creature that resembles a turtle. There appear to be no openings in the monument leading to tunnels or inner rooms, thus its purpose remains a mystery to teams of underwater historians and archaeologists who have spent the past 15 years studying the structures at the site. Found alongside the monument are 10 other structures that include a castle, five buildings that appear to be temples, plus a large stadium. All are connected by roads and . . . if you can believe it . . . water lines. The ruins at Yonaguni have survived the ages because they were apparently cut from solid rock. But what else might have one time been part of this strange and ancient complex? Can we imagine a large city of wooden shops and homes surrounding the castle, the stadium and monument, which would have been the heart of the community? And did these buildings have some kind of social or religious significance? Masaaki Kimura, who has led a group of scientists to the site from the University of Ryukyus, gave a report to the Twenty-First Pacific Science Congress in 2007 in which he revised his estimate of the age of the site. He said he could date it to a period between 2,000 and 3,000 years ago. Instead of rising sea levels, Kimura suggested earthquakes and tectonic activity caused the site to drop below sea level. Kimura also proposed that the site may be a remnant of the mythical lost continent of Mu which, like Atlantis, was said to have sunk into the depths of the Pacific Ocean at some ancient time in the past. There may have been professional reasons for Kimura to have changed his estimate of the date of the ruins. Like so many discoveries of this kind, the idea that the formations are the ruins of an ancient city from the distant past has drawn a line of scoffers in the archaeological community. Patrick D. Nunn, professor of Oceanic Geoscience at the University of the South Pacific, noted that the formations below the water also are found in slate cliffs on the island. He suggests that they were formed by the natural process of wind and water erosion. Researcher John Anthony West suggested that “walls” of so-called structural ruins are natural horizontal platforms that fell into a vertical position and that the alleged roads are natural channels in the rock. Geologist Robert Schoch from Boston University takes a middle-of-the-road approach. While he suggests the sandstone formations were mostly natural, he perceives human “modifications” that altered rock formations that may have been used by an early civilization. Even alternative history writer Graham Hancock has questioned whether the sandstone formations are man-made. Hancock, however, agrees that formations like these are found all over the world, but he agrees that the concentration of so many peculiar formations in one small area is highly unlikely. The problem that the established archaeological community shares is: there is no general agreement that early great civilizations ever existed on the Earth. To suggest that a developed culture once pre-dated ours is considered blasphemy by the church because it challenges the Genesis story. Yet anyone who has ever studied the Genesis account knows it is so full of contradictions and violations of scientific proof that it has little value as a historical record.